Wondering what Snapchat’s audience responds to? In this article you’ll discover recent insights on Snapchat and how marketers can use the platform to reach targeted audiences with ads and other content. 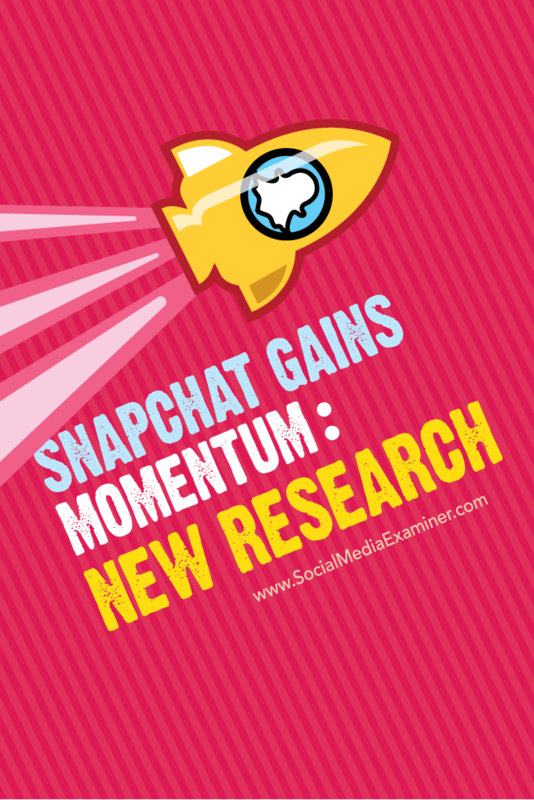 Discover the latest insights on Snapchat and ways marketers can use it to reach their target audience. In January 2016, Bloomberg News reported that Snapchat now delivers more than 7 billion videos to users each day. The news is amazing for two reasons. First, previously reported numbers of Snapchat daily video views in September 2015 was 4 billion. A leap of nearly 50% in just three or four months is certainly newsworthy. Second, Facebook reported 8 billion video views daily in October 2015. Considering that at 1.55 billion users, Facebook’s audience outstrips Snapchat’s by 15 times, it’s clear video is Snapchat’s primary content form. Key Takeaway: Snapchat’s 7 billion daily video views figure is important because mobile video is rapidly gaining favor with advertisers. According to eMarketer, companies spent $7.46 billion on digital video ads in the U.S. in 2015, an increase of 42% from the year before. eMarketer also relates that in the United States, mobile video ad spend is growing faster than all other digital advertising tactics. Marketers with a video strategy in place can easily adapt their tactics to reach Snapchat’s video-friendly demographic. When Snapchat emerged on the scene, some industry pundits criticized its vertical-only display as too limiting and unfamiliar for those used to more horizontal television and movie screens. Now, after five years in business, Snapchat reviewed its own internal data to find that users are more likely to watch a vertical video than a horizontal video until the end. 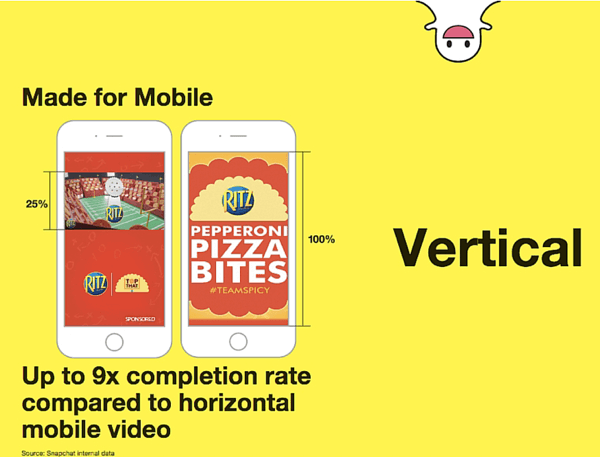 In some instances, the vertical video had a completion rate nine times higher than its horizontal counterpart. 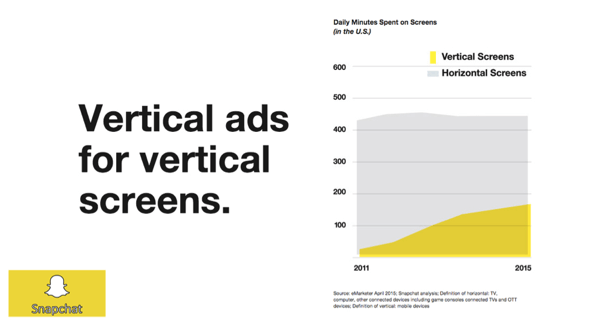 Minutes spent on vertical screens have increasingly been edging out those spent on horizontal screens since 2011. Users are spending more time on vertical screens. Key Takeaway: Of course the consumer who views a mobile video until the end is more likely to respond to the call to action. Marketers will appreciate this finding because they typically put their strongest call to action at the end. It’s also worth mentioning that if Snapchat’s findings are correct, it’s possible that although video consumers are accustomed to videos being horizontal, they’re more accustomed to their phones being vertical and staying that way should a text or call come in. Marketers should consider testing response to their own video to see which orientation their followers prefer. Every day, between 300 and 350 million photos are uploaded to Facebook. With an audience of 1.59 billion and 1.04 billion monthly active users, the portion of the audience participating by uploading photos is less than 35%. One of Snapchat’s primary sales points is frequency of use. Its 100 million users visit the platform daily. Facebook started measuring their monthly active users (MAU), implying that the number of people going to the channel even once every 30 days constituted success. Snapchat users return to the platform often. Image: Shutterstock. Snapchat founder Evan Spiegel scoffs at that metric, stating the time frame is far too long and not much to boast about. The numbers his company measures focus on daily activity. Key Takeaway: Engagement is such a sought-after metric because marketers know that those who are interacting with a company are far more likely to share and talk up its posts, offers and products. The engaged consumer uses the company to build a portion of his or her identity. The user with this level of emotional tie-in promotes and buys far more than the passive user just perusing the latest sound bite or unique fact. Once the platform becomes saturated, it requires far more time and budget to pull attention away from competitors. According to comScore’s The 2015 U.S. 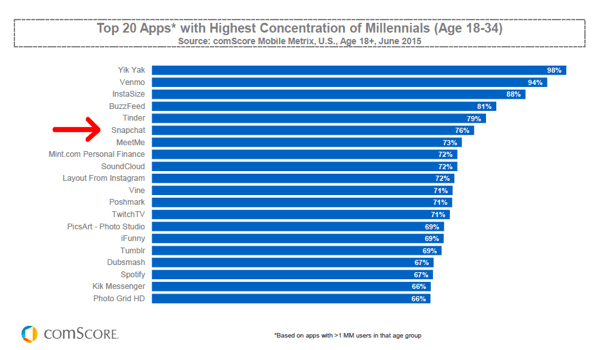 Mobile App Report, Snapchat has the sixth-highest concentration of Millennials. ComScore finds that 76% of Millennials use Snapchat. The study of 1,084 smartphone users also concluded that 18- to 34-year-olds spend an average of 6 hours on Snapchat each month, right behind Instagram’s 7 hours but far behind Facebook’s 25 hours. Still, at just 5 years old, Snapchat has some work to do to catch up with the 12-year-old Facebook and 6-year-old Instagram. While trailing Facebook significantly, marketers know that Millennials and others use several social channels daily. Key Takeaway: With 76% of Millennials using Snapchat, any business catering to that prospect should consider taking the risk and reaching out on the platform. 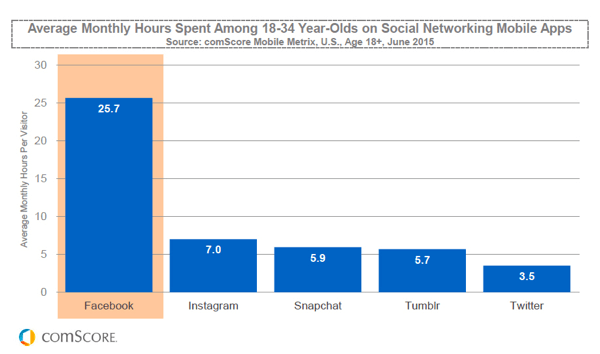 Keep in mind too that Millennials and younger generations use several social platforms. As yet, Snapchat is far less saturated with advertising than Facebook. With the advantages early adopters enjoy, it’s no surprise that marketers have been paying attention to Snapchat’s promising developments. 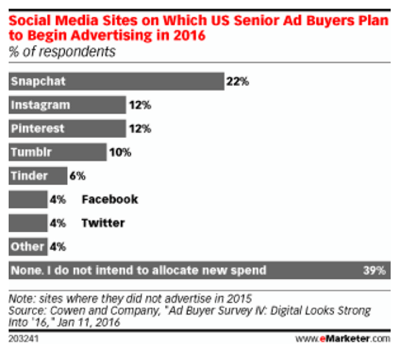 As reported in eMarketer in January 2016, more senior ad buyers are planning to begin advertising on Snapchat than any other social media site. This statistic can be misleading, however, because a portion of these ad buyers have already begun advertising on Instagram, Pinterest, etc., and the survey measures new efforts. The chart below shows how numbers for Facebook and Twitter stand at 4%, clearly because most ad buyers are already there. Still, the poll does reveal that more marketers plan to test Snapchat’s platform and performance this year. Marketers show their willingness to try yet another social media platform in 2016. Looked at in another way (one that Snapchat may prefer), 60% of America’s 18- to 34-year-old smartphone users use the platform. Depending on business size and target market, those numbers can be appealing, particularly for businesses with nationwide reach. Nationwide U.S. businesses with Millennial audiences should benefit the most from a Snapchat presence. Key Takeaway: While C-suite executives can accuse marketers of chasing the most recent fads, marketers have learned that jumping onto a new digital outreach tactic can pay off. Early adopters enjoy a less-crowded playing field where individual companies can stand out. Recently, Snapchat reduced introductory advertising rates from $700,000 to $100,000, indicating it will be offering more advertising opportunities to more companies. Still, Snapchat advertising is inaccessible to most small businesses at this time. 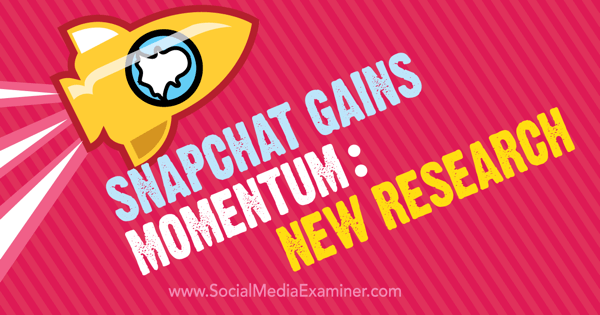 That doesn’t mean a small business can’t have a presence on Snapchat, however. Businesses of all sizes can deliver messages and entertaining snaps to boost visibility. What do you think? Do you plan to explore Snapchat as an advertising option? Will you start building your own stories to reach and convert a Millennial audience? Let us know in the comments below! Tips on the latest Snapchat insights and how marketers can use the platform to find and reach their ideal audience.